Peace Love and Crepes, is now at the market every second Tuesday, serving delicious sweet and savoury creations (including vegan and gluten free options). Cooking crepes is in Cecile’s blood as her family come from Brittany in France, which is considered the birthplace of crepes. So she makes the traditional egg, cheese and ham, using the savoury base. Others include La Vegan, a combo of organic spinach, tomatoes, local mushrooms, local olives and homemade pesto; and the La Special, with free-range egg, spinach, tomatoes, olive and Nimbin cheese. 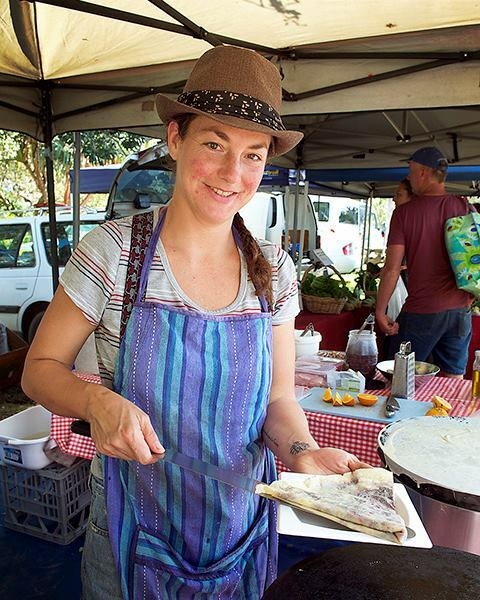 Cecile makes her savoury crepe batter the traditional way – with organic buckwheat flour – but has adapted the recipe so that it is vegan as well as gluten free. And although savoury is Cecile’s personal preference, her menu has plenty for the sweet tooth. Toppings including local honey; homemade local blueberry, raspberry and strawberry jam; homemade chocolate sauce; and the very-French salted butter caramel, hand made by Cecile and 100 percent organic. John Picone, will guide you through his exotic orchard which boasts some 200 exotic fruits and 20 vegetables. The species originate from South America, Europe, Asia, India, Japan, and Mexico and are from traditional stock. The trees are not grown in a hothouse, but are often growing in conditions quite different from their origins. John’s very personal touch and spray free methods are essential to the successful growth and harvest and even include some hand pollinating. Surprising species found in his open garden include the vanilla pod orchids, and the pepper plant, normally not found in this climate. John is an Encyclopaedia of knowledge on growing, cooking, preserving, bush kitchen preparing and nutritional qualities of his produce. His personable stories, are rich with generosity of sharing and garnished with astounding flavoured samples..
Come and meet sprouter and naturopath Ruth and lovely partner Michael. You won’t regret it and you’ll give your health a nice little boost in the process.Did you know sprouts are one of the most nutritious foods you can eat? They are a living food, literally bursting into goodness. At the moment of sprouting there’s an explosion of nutrition that happens within the seed. Sprouts are packed with vitamins, enzymes, protein and minerals. We have a wide variety, so there’s something for everyone. Summit Organics is a family-owned 338-acre (128 hectare) property, right next to the World Heritage-listed Border Ranges National Park. The vegetable production area is an intensive market garden and utilises approximately six acres. We produce more than fifty different vegetable and herb crops in a year and are certified organic. All of our fish is sustainably sourced from local fishermen, with a special focus on plentiful species high in Omega 3 oils. These fish are absolutely delicious when smoked, as well as very good for you. All of our products are ready to eat and perfect for all occasions. We also make a range of gourmet dips and pates, using our seasonally caught smoked fish. We pride ourselves on our sustainable connection with the ocean and a complete dedication to traditional processes and incredible flavour.